Wilbur Wright was born on April 16, 1867, in Millville, Indiana. Orville was born on August 19, 1871, in Dayton, Ohio. Their parents were Milton Wright and Susan Catherine Wright. The Wrights' siblings included two older brothers, Reuchlin and Lorin, and a younger sister, Katharine. Milton Wright was a bishop in the Church of the United Brethren in Christ and editor of the church newspaper. Wilbur and Orville attended the local public schools in Dayton, but neither graduated from high school or attended college. Nevertheless, they grew up in an environment that encouraged creative and intellectual development. Their household included a large family library from which the brothers read extensively. While not necessarily well schooled, the brothers were well educated. The Wright brothers were continually looking for new challenges. As young men, the two brothers went into business together. In 1889, they opened a print shop and published a local newspaper using a printing press they designed and built. In 1892, they opened their own bicycle shop. By 1896, they were manufacturing their own bicycles called Wright Flyers. It was their interest in flight, however, that led to their fame as adults and reshaped the world. The Wright brothers' interest in flight was inspired by the feats of gliders such as Otto Lilienthal, who died in a glider crash, but demonstrated that manned flight was possible. Reading everything available, the brothers began experimenting with wing designs for an airplane. Starting in 1900, they conducted numerous tests on the sand dunes at Kitty Hawk, North Carolina. Gradually, their experiments led them to envision a bi-plane that could be guided by warping the wings. Wing-warping enabled the pilot to control the plane by creating more or less lift on the wings on either side of the airplane. Their ingenious design created the breakthrough needed to achieve controlled, manned air flight. The final ingredient necessary for sustained, manned air flight was a power source. The Wright brothers determined that a propeller driven by a gasoline engine could provide enough power to sustain flight. When they tried to purchase a lightweight engine that met their specifications they were unable to find one. So, typical of their nature, they built their own. 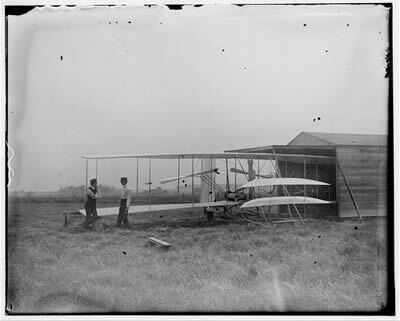 On December 14, 1903, the Wright brothers were ready to test the aircraft they had built. With Wilbur at the controls, the experiment failed and the plane sustained minor damage. After repairing the aircraft, they tried again on December 17. This time, with Orville piloting, the plane stayed in the air for 12 seconds and covered 120 feet. The length and duration of the flight were not much by today's standards, but the Wright brothers had demonstrated that sustained flight in a heavier than air craft was possible. The brothers tested their aircraft three more times that day with increasing levels of success. The final flight of the day carried Wilbur 852 feet in 59 seconds. Many Americans, including journalists, did not believe the story of the Wright brothers' first flight. Only five Ohio newspapers covered the story. The others refused to believe that flight was possible. Undaunted, the brothers continued to experiment with their aircraft, moving their operations to Huffman Field near Dayton. Initially, they found it difficult to obtain the funding they needed to capitalize on their invention. They attempted to interest the United States military, but government officials were skeptical. In 1906, the Wrights received a patent for their invention, providing them the security they needed to pursue funding more openly, without fear of competitors stealing their designs. By 1909, they obtained enough financial support to organize the Wright Company. With Wilbur serving as president and Orville as vice-president, the company manufactured airplanes in Dayton and operated a flight school at Huffman Field. Wilbur Wright's tenure as company president was cut short when he contracted typhoid fever. He died on May 30, 1912. Orville assumed his brother's position as president of the company, but he had little taste for executive life. He sold the company in 1915 and retired from the aircraft business. Orville made his last flight as a pilot in 1918. For the next 30 years, Orville served as an adviser on numerous aviation boards and organizations, including the National Advisory Committee for Aeronautics, the predecessor to the National Aeronautics and Space Administration (NASA). In January 1948, at the age of 76, Orville Wright suffered a heart attack and died at Dayton. The brothers are buried in the family plot at Woodland Cemetery in Dayton.